Iboy is an 8 year old boy who works as a scavenger. He has no idea whom his parents are. According to the other scavengers, Iboi was found in a pile of rubbish 8 years ago. In his day to day life, Iboy has no friends. The other children, l-ed by Edo, play tricks on Iboy by taking away all that he collects. He feels very lonely. One day, Iboy finds a jar with a firefly inside. He opens the jar. It turns out to be a tiny fairy named Airi. Airi is angry at Iboi for taking her out of the jar as she was hiding from an evil fairy. She is hiding because she has a magic marble which has amazing powers and can make the evil fairy forever young with extremely strong powers. She doesn't want to get chased by the evil fairy and so decides to give the marble to Iboy. She then leaves. Iboy, in confusion, takes the marble and later stumbles and falls. The magic marble rolls out of his hand and lands on top of a stuffed bear toy. At the very moment the toy bear comes alive and stays to talk. Iboy is total caught of guard and runs in fear. He falls into a river and the toy bear helps him out. They get to know one another. The toy bear is later named Teddy. Teddy wants to be Iboi's friend and follows him everywhere. Iboy refuses to have Teddy follow him because he is a boy and boys don't play with stuffed toys. But Teddy always has over a thousand ways to follow Iboy. Iboy is upset because Teddy is causing a lot of problems for him. 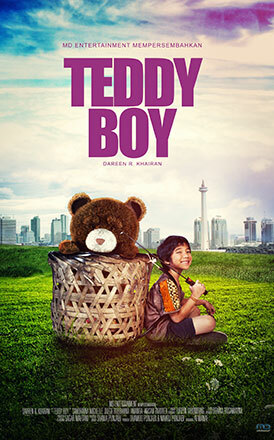 Because of Teddy, Iboy is always penalized by Ichsan, the boss of all the scavengers. Edo also hates Iboy all the more now. Every time Iboy blames Teddy, he is made fun of and considered crazy because in front of everyone Teddy fakes as an ordinary toy. Meanwhile, Airi feels very guilty for giving the magic marble to Iboy. She is afraid that the evil fairy may harm him. She decides to look out for Iboy and tries to get back the magic marble. However the evil fairy is aware that the marble is now with Teddy. She tries to take it back anyhow. Iboy, who has all this while been hostile with Teddy, has no choice but to run away with him as they do not want the magic marble to get into the hands of the evil fairy. Airi too helps Iboy and Teddy. The adventures of Teddy, Iboy and Airi will be an exciting programme for children to watch as it is funny, touching and filled with morals.